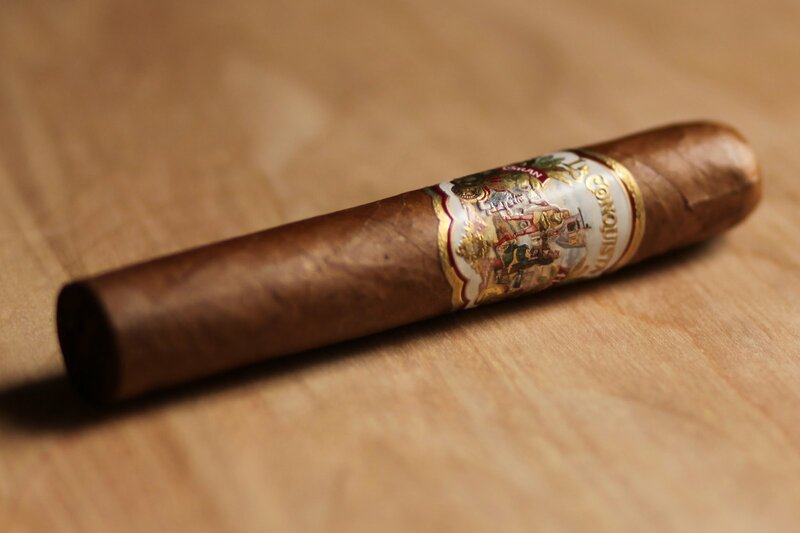 Up for review today is the Gran Habano La Conquista La Nina, a cigar that’s probably most notable for the detailed artwork adorning its primary band. After sitting in my humidor for about six months, the time seemed right to pull it out for an early afternoon smoke. What I didn’t realize before getting settled to write the review is that I’d be smoking a cigar with a profile perfectly suited for an early-afternoon smoke. 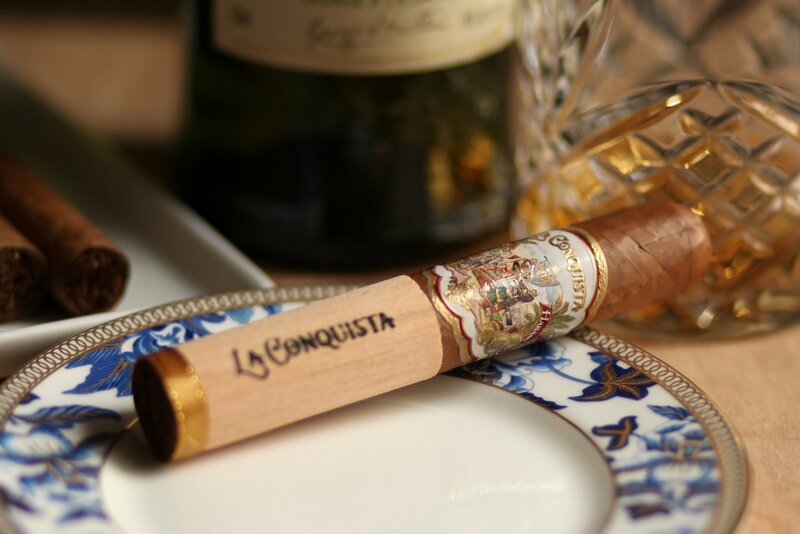 The outer Corojo wrapper on the La Conquista is light leather brown, with a few significant veins and smooth texture. The band is large and ornate, with a scene depicting what looks to be a soldier or king with subjects bowing to him. From an artistic standpoint, especially compared to most other art-focused bands, this band is quite good. As for the cigar,off the foot is I pick up notes of old cedar planks and some earth, while the pre light draw reveals some mild natural tobacco sweetness. The draw sits right in between slightly too loose and slightly too restrictive. That is to say, it’s perfect! The La Conquista La Nina opens with some wood, spice, charred meat and gentle sweetness. On the finish is a wood pulp note that slightly bitter and none too enjoyable. Smoke production though is excellent, and the character of the smoke is that it is light (definitely mild bodied) but nicely textured. This makes it a great candidate for pairing with a cup of coffee or espresso early in the afternoon. As the ember hits the second third, the smoke shifts and takes on a character that I find very attractive. The texture of the smoke is extremely fine, and the flavor profile has shifted to become sweeter and more elegant. Flavors and aromas mix together creating impressions of snickerdoodle cookies, light woodiness, and floral notes. The retrohale balances the mildness out with just the right amount of white pepper. The fact that this cigar does this while remaining so mild is impressive. This profile doesn’t stay too consistent as it fades in and out with the intervals presenting a more generic profile of wood, pepper, and natural tobacco flavors. A bit disappointing, but still enjoyable. Into the final third, the La Conquista recovers and settles on a profile of light woodiness, floral, fresh cookies, albeit without the spice on the retrohale to balance the profile out. Still, a great profile and a nice end to the cigar. From a construction standpoint, the burn did become wavy at times, but always corrected itself and never required touch ups. La Conquista by Gran Habano Cigars is a winner in my book. It’s not a cigar that will be enjoyed if you’re looking for a full bodied smoke, but as an early afternoon cigar it offers a lot of flavor with great complementarity. And though it had a few unenjoyable moments, the positive elements outweighed those moments by a long shot. I recommend giving the La Conquista a try and potentially stocking up.